Are you interested in going to college for dumpster diving? You should be! No, not for a degree. We’re talking about going to college to take advantage of the annual campus exodus: move out day. At the end of the spring semester, college administrators issue a required move out date for campus residents. By this date, students and their belongings must be removed from their dorms and apartments. Between the limited time and space, many items are left behind. Since students can’t leave items behind in their rooms, many of them end up by the curb or in a dumpster. The left-behinds may include photos of friends, term papers and used notebooks, but we suspect you’ll find some great treasures, too. Most of the time, students will carefully pack their belongings in preparation of move in day at the beginning of the school year. Items are meticulously packed to save space and strategically loaded into cars in anticipation of turning a new dorm room into a home away from home. On move out day, this processes is often rushed and many items that were accumulated over the course of the year simply don’t fit. For out of state students, they may not have the ability to make multiple trips. As a result, replaceable items are left behind. Their loss, your gain. If you dig through a dumpster on a college campus shortly after move out day, you will probably find a wide range of items. From hand me down furniture from Mom and Dad’s basement and discarded school supplies to forgotten clothes and shoes and small appliances and kitchenware. Move out day turns college dumpsters into a virtual treasure chest. Move out day provides a small window with big possibilities. There are many treasures to be found, but campus administrators are usually pretty quick to clear out all those left-behind student belongings. Don’t wait until the last minute to plan your campus visit. Find out when school is out for the year. This information is often available on their website or you can call the campus offices and ask. They may even be able to provide a precise time when the campus residences are closed for the semester. Once you know the required move out date and time, you can plan accordingly. If you can, stop by that evening once all the students have moved out. The early bird gets the worm, or, in this case, the mini-fridge. We’re convinced you’ll find lots of great items, but so will anyone else who stops by campus. That bookshelf in near perfect condition that just didn’t fit in mom’s sedan? You’re not the only one that will gladly find a way to transport it home. You’re also going to be racing the clock. Many college and university campuses offer summer courses or camps. The college may also have summer tours scheduled for prospective students. In order to prepare campus for new guests and residents, they will clear out these fully-loaded dumpster as fast as possible. If you wait too long, you may miss out completely. 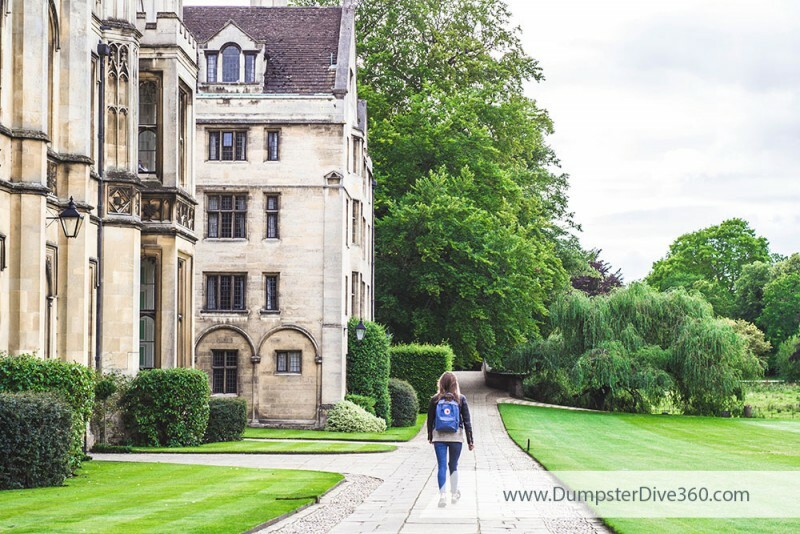 Have you gone dumpster diving on campus before? Will you be checking it out for the first time this semester? Check in at DumpsterDive360.com and tell us what move out day treasures you’re taking home.